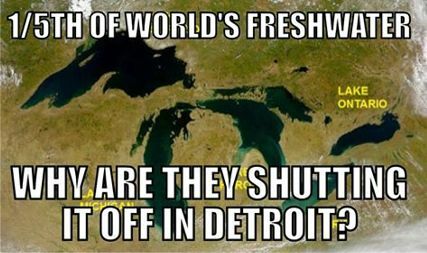 DETROIT SHUTS WATER OFF AGAIN, VIOLATING UN DECLARATION; WHEN WILL CITY RISE UP? Protesters stop Homrich trucks from leaving to shut Detroiters’ water off on July 18, 2014. Nine were arrested. Meanwhile, tens of thousands of protesters gathered in downtown Detroit. Homrich water shut-off trucks like these are coming to Detroit neighborhoods to shut off life-giving water for thousands of poor children, seniors, disabled and retirees. What should be done to stop them? 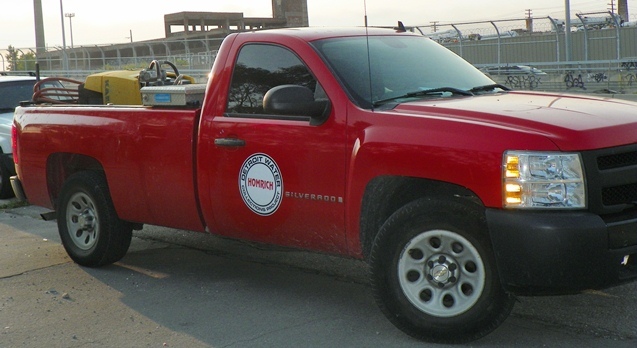 DETROIT – City contractor Homrich’s water shut-off trucks rolled out like thirsty beasts yesterday, targeting Detroit residents who owe more than $150 to the Detroit Water & Sewerage Department (DWSD) and are at least 61 days late on their payments. “As of today, DWSD expects that contractors will conduct 1,000 shut offs this week, however, that number is likely to drop as more account holders enter into payment plans,” a release from Detroit Mayor Mike Duggan’s office said. Neighbor brings water to a family victimized by 2002 shutoff. DWSD Deputy Director Daryl Latimer estimated that 21,000 Detroit residential accounts are delinquent, but claimed most customers will enter into payment plans to forestall shut-offs. He said 30,000 customers are currently in payment plans, totaling over 50,000 delinquent accounts. 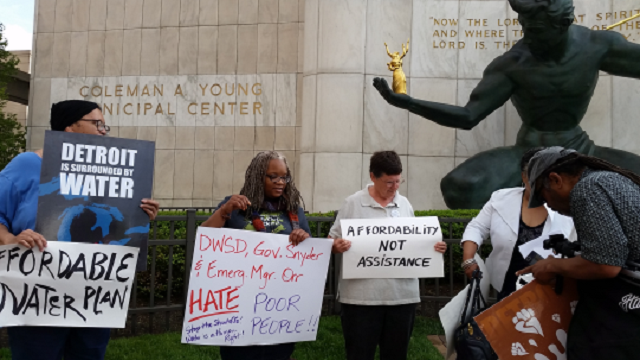 The release does not mention a plan to permanently shut off 8,335 households that turned their own water back on, which members of Detroiters Resisting Emergency Management exposed in their editorial (see end of this post). Demeeko Williams speaks at May Day protest against Detroit bankruptcy in 2014. 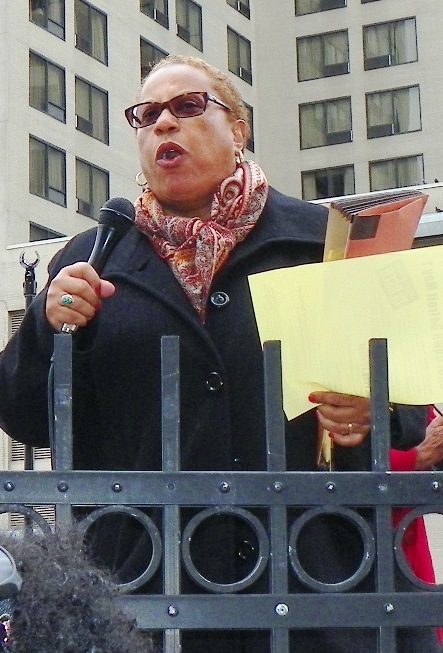 Williams said mass water shut-offs are aimed at driving Detroiters out of their homes and out of their city. She said hundreds of thousands of people, mostly African Americans, had their water ruthlessly turned off, resulting in families with children, the elderly and the sick being unable to bathe, flush their toilets, or cook. Latimer said monthly bills currently average $75, with delinquencies averaging $755. Bills have risen at least 119 percent over the last 10 years, according to IPS News. The city release said Duggan’s Detroit Water Fund, administered by the United Way, “will now pay 50 percent of all past due amounts on arrearages up to $2,000 and 25 percent toward future water bills for 12 months,” for “qualifying” low-income residents. Regarding payment plans, Williams said all of the people his group enrolled into the Water Fund fell off the plans when they could not continue payments. He said detailed personal information required to “qualify” for the plans prevents many from enrolling in them. The Detroit Water Brigade supplies free water by the gallons to people without asking a single question. Another non-profit, The Heat and Warmth Fund (THAW) announced May 25 that the investment banking firm of Miller Buckfire donated $1 million to assist it with paying water bills. Miller Buckfire was a prime mover in the Detroit bankruptcy, which stripped the city of assets, retirees and workers of their pensions and health care, and residents of services. It charged the city of Detroit $28 million in fees for negotiating deals tied to city water and sewer debt and securing Detroit loans. Their efforts actually restored $2 billion in DWSD debt that creditors were originally asked to forego, of the total $5 billion load. 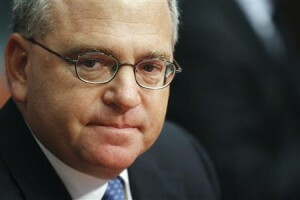 “Forty-six cents of every water bill goes to pay off that debt,” Williams said. 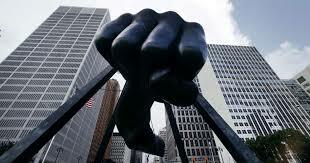 Under terms of the Detroit bankruptcy Plan of Adjustment, all debts must be paid first before any improvement in services to the people takes place. “Average Unit Cost must be increased to eliminate revenue shortfall,” a DWSD power point presentation to the Board of Water Commissioners (BOWC) said in February. 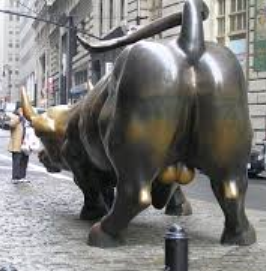 Profits from increased water debt will go to Wall Street, represented here by its bull. In other words, the BOWC and later the GLWA plans to increase large-scale borrowing from Wall Street banks in the years to come. The BOWC claims revenue shortfalls are due to the secession of the city of Flint from the DWSD operating system, as well as problems with payment from the city of Highland Park. A federal judge recently enjoined DWSD from shutting off water to that impoverished city due to its failure to pay its water bills. Documents provided to the Board of Water Commissioners indicate that suburban wholesale customers of DWSD are responsible for 26.2 percent of the revenue shortfall, while Detroit retail customers are responsible for only 8.2 percent. The debt restoration was a key part of the bankruptcy agreement to create the regional Great Lakes Water Authority (GLWA). Under its terms, DWSD assets and infrastructure paid for by Detroiters in bond issues throughout the last century are about to be stolen. Only minor pipelines in Detroit will remain under DWSD’s control. All water and sewerage treatment plants will go to the GLWA, along with thousands of miles of infrastructure in the six counties originally controlled by DWSD. 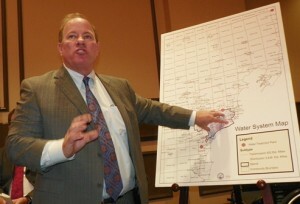 “Mayor” Mike Duggan shows what will be left of DWSD on map of six counties to be taken over by GLWA, during press conference. The GLWA plans to “lease” the six-county, $6 billion DWSD enterprise agency for $50 million a year, beginning July 1. However, documents recently released to the Board of Water Commissioners show DWSD itself will be responsible for $14.4 million of the annual lease payment. 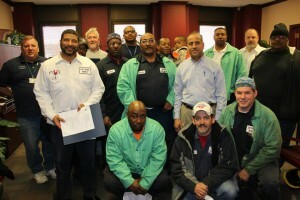 The “lease” will mean the loss of thousands of jobs for Detroiters in DWSD. DWSD workers who stopped the water main break at the WWTP in January, 2015. Their jobs are in jeopardy. DWSD has had one of the highest percentage of Black skilled trades workers for years, but now Mayoral aide and GLWA board member Gary Brown says he can’t find qualified workers. Retired DWSD worker Bill Davis, President of the Detroit Active and Retired Employees (DAREA), earlier told VOD that many sewage pumps at the Wastewater Treatment Plant no longer function due to the loss of staff. Instead of 24/7 maintenance, the pumps are checked only periodically. Wall Street ratings agency Moody’s Investor’s Service reported earlier that the formation of the GLWA was likely a “credit positive” for DWSD bondholders. The GLWA is set to “refinance” the $5.2 billion DWSD debt, meaning the principal and interest will increase to the profit of Wall Street. 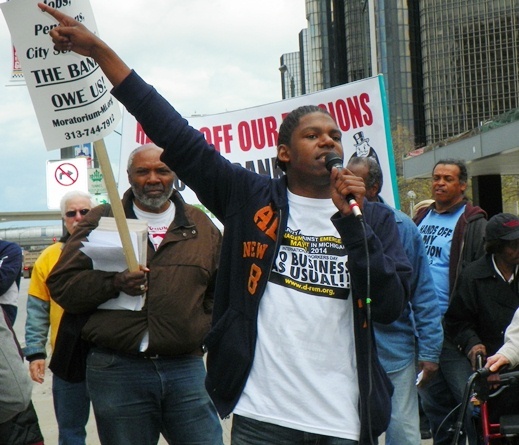 Water shutoff protest in Detroit, July 18, 2014. Banner at top refers to illegal $537 million interest rate swap that was not addressed during bankruptcy. Unlike the City of Detroit, whose debt ratings have been bombed to basement levels by Wall Street over the past decades, DWSD until recently maintained high ratings. It was only as plans for the bankruptcy were being laid that Wall Street started to lower DWSD bond ratings, meaning higher interest payments would be required. Municipal Market Advisors earlier said of the final Detroit bankruptcy plan that it ravaged the city of so many assets and revenue-producing functions that Detroit would likely be the next candidate in Michigan for another Chapter 9 bankruptcy filing. More water shut-offs are likely once new water and sewerage rates proposed by the Board of Water Commissioners (BOWC) take effect July 1, if approved by the Detroit City Council. Proposed increases in water rates for Detroit and suburbs. Rates for Detroiters will rise a total of 20.1 percent, meaning an average bill will skyrocket to $90 a month. 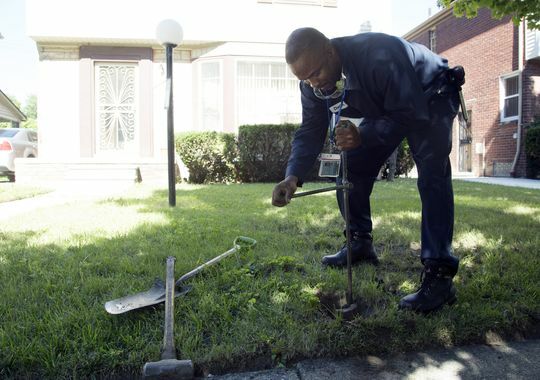 Detroit sewerage rates account for 16.7 percent of the hike. For over a decade, Detroiters have been penalized with higher sewer rates, allegedly to make up for higher delinquency rates. U.S. Environmental Protection Agency guidelines suggest that water bills should not exceed 2.5 percent of household income, Rev. Tom Airey of St. Peter’s Episcopal Church, said at a BOWC public hearing Feb. 25. Detroit’s median annual income is $26,119, so monthly bills should not exceed $54 a month for those at the median level. They should be proportionally less for customers falling below the median income level. Suburban wholesale rates are expected to rise 12.4 percent, with only 1.1 percent going to sewerage. Charts provided to the Board of Water Commissioners indicate that suburban wholesale customers of DWSD are responsible for $26.2 million of the water revenue shortfall, while Detroit retail customers are responsible for $8.2 million, with a projected bad debt collection of 85 percent. 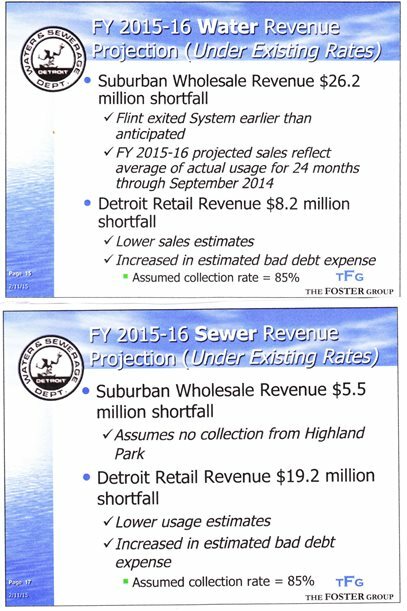 Suburban wholesale customers are responsible for $5.5 million of sewer revenue shortfall, with Detroit retail customers responsible for $19.2 million, again with an expected collection rate of 85 percent. 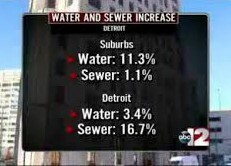 Of course, the Detroit sewer shortfall reflects the much higher sewer rates assessed to the city’s residents. That totals $31.7 million in suburban wholesale revenue shortfalls, with $27.4 million in Detroit retail shortfalls. So if revenue shortfalls are the main reason for rate increases as DWSD claims, why are Detroiters being hit with far higher rate increases than those in the suburbs? 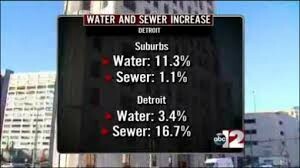 The charts also do not include the loss of revenue due to water shut-offs in Detroit, which do not take place in the suburbs. An uncalculated number of Detroiters have been forced to leave their homes because they have no water, or because water bills are attached to their property tax bills and they are foreclosed. They likely have fled the city to more friendly environs, further reducing its tax base. To read complete report just referenced, click on Bowc_briefing_proposed_FY15-16rates_02-11-2015.compressed. The GLWA pledged that water rates would rise no higher than 4 percent for the next 10 years, but now is rapidly backtracking, indicating it was not referring to individual customer rates, but to budget revenue estimates. Protesters outside Coleman A. Young Municipal Center May 18 demand a water affordability plan. Detroiters called for a “water affordability plan” that would link rates to customer income after the shut-offs in 2004. Such a plan, authored by Roger Colton, was proposed by numerous groups including Michigan Welfare Rights, Michigan Legal Services, and the Michigan Poverty Law Center. After much haggling with the Kilpatrick administration, the City Council finally passed a watered-down version of the plan. But even that plan went down the toilet after the Detroit Human Services Department, which administered it, was deactivated by former Mayor Dave Bing. 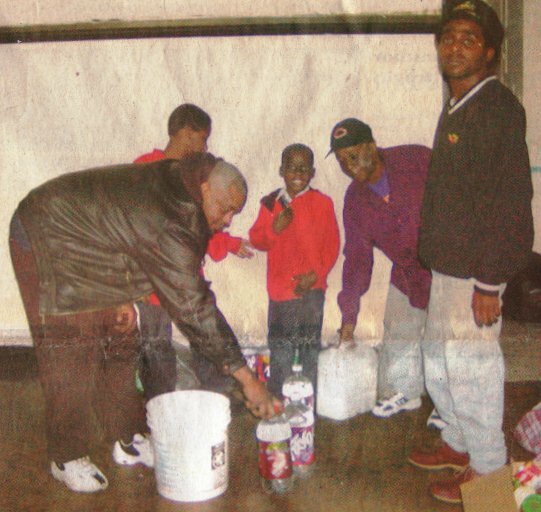 Its federal funding and jobs went to Wayne Metro Community Action Agency in suburban Wyandotte. Members of Detroiters Resisting Emergency Management, Gloria House and Shea Howell, raised the cry for another water affordability plan in the following passionate editorial published on the website of the People’s Water Board. Homrich worker shuts off water last year. “According to the newly created Great Lakes Water Authority (GLWA), nearly 36,000 households in Detroit are facing water shut-offs as soon as the weather clears. The Detroit Water and Sewerage Department is targeting commercial accounts first with an outstanding debt of about $20 million. In the same breath, however, they list another “first:” They will permanently shut off 8,355 households that have turned their own water back on. Calling these “illegal hookups,” the water department is trying to criminalize desperation. The fact that people have been driven to this extreme step, along with 26,000 other households behind on bills, is clear evidence of the inadequacy of Mayor Mike Duggan’s assistance programs. Clearly, Detroiters are still struggling despite the celebratory tone that greeted the end of official bankruptcy proceedings. The sheer numbers of people slated for shut off should have been a wake up call to city leaders last year. It’s long past time for the water affordability plan (WAP) to be implemented. The WAP adjusts payments based on the reality of people’s income. It would keep the water and the revenue flowing. 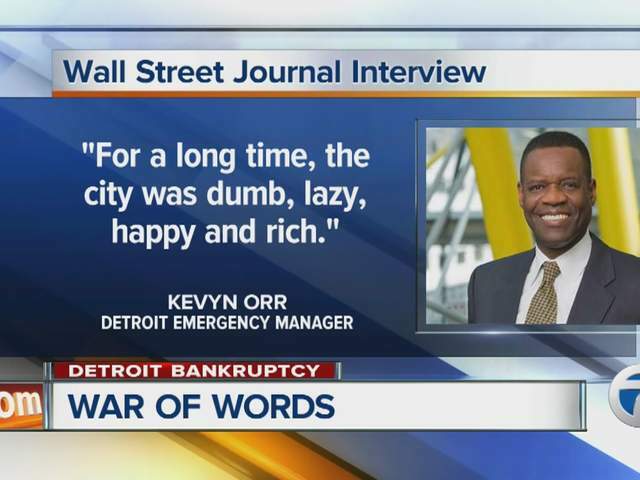 Detroit Emergency Manager Kevyn Orr’s infamous words to the Wall Street Journal. The rationale for resistance to the WAP shows up in the minutes of the GLWA meeting and it isn’t pretty. The goal of the aggressive shutoffs is “changing the culture regarding the responsibility to pay for service.” But the only way a sentence like that can make sense is if you believe there is a current culture where people are irresponsible and not willing to pay for their services. This is the same belief that Detroiters are not paying water bills or property taxes because, as former Emergency Manager Kevyn Orr said, we are “dumb, lazy, happy and rich.” Bill Nowling, then Orr’s spokesman, tried to get him out of that comment by saying he believed the comments were “about the attitude of the body politic of the city of Detroit, not Detroiters themselves.” Such nonsensical distinctions are offered to cover the deep-seated racism that characterizes the attitude of many people toward Detroiters. This attitude pathologizes the people of Detroit. It casts us as deficient, ignores our history, denies our humanity, and disrespects and diminishes our lives. It functions to blind the public to both the pain and the strengths of the city. Most Detroiters know that we not only work hard, but we often do the hardest work. Detroiters have survived ongoing catastrophes with responsibility and determination. With the disappearance of jobs and capital, we have been struggling to create new ways of living and working together. We have a long history of “making a way out of no way.” We pay our bills. In fact, we have willingly voted ourselves the highest taxes in the state in order to provide for our schools, parks, community colleges, museums, zoo and art programs. Now with jobs gone, pay cuts, pension cuts, increasing medical bills, increasing heating bills, the highest water rates in the state, predatory lending, overinflated property taxes and auto insurance more than double that of the suburbs, people are scrambling to keep home and hearth together. Attorney Alice Jennings announces filing of water lawsuit outside bankruptcy proceedings. A lawsuit demanding an end to water shut-offs, restoration of water service, and affordable rates, filed by numerous progressive attorneys during Detroit’s bankruptcy proceedings to great fanfare, is going forward at a snail’s pace, after U.S. Bankruptcy Judge Steven Rhodes predictably deep-sixed it. It has now been appealed to U.S. District Court, where Judge Bernard Friedman is hearing it. It was appealed to the District Court on January 7, 2015, with the last action, an exhibit list filed by the plaintiffs, on April 19, 2015. Click on WATER AFFORDABILITY FEDERAL LAWSUIT DOCKET to see actions taken. Click on DetroitWater-TRO to read plaintiff’s brief for a temporary restraining order on shut-offs until the lawsuit is resolved. 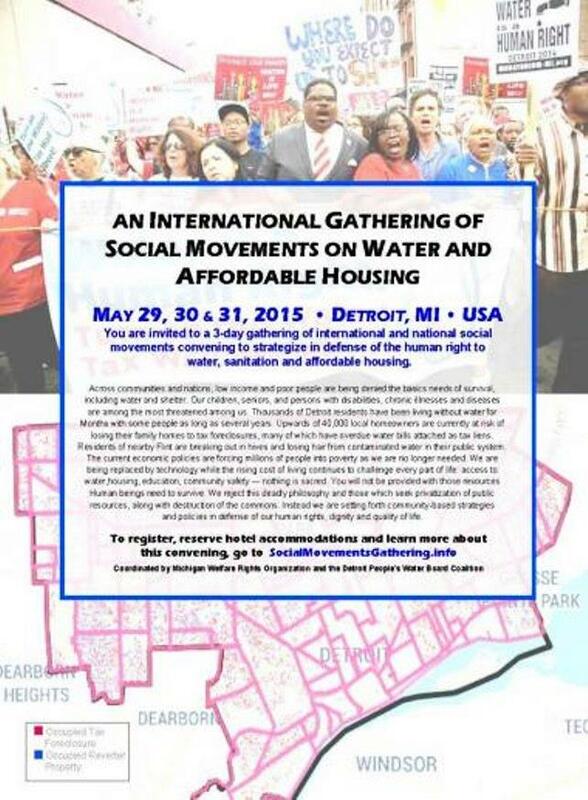 A May 29 through 31 international conference is planned in Detroit. See post below. Note: unfortunately, according to link associated with above poster, registration is closed and there is no more room for on site registrations. Hopefully some useful new strategies will arise from this conference. So far, mass protests and arrests, conferences, lawsuits, and other tactics have not worked against the gravely inhumane policy of shutting off water to people in the poorest and Blackest city in the country. As Detroiters enter this third era of water shut-offs, perhaps they should take a lesson from the people of Ireland, who have been flooding streets across every city in the country to demand an end to charges for water. Water was originally provided free of charge to the Irish people, financed by the government through taxes. 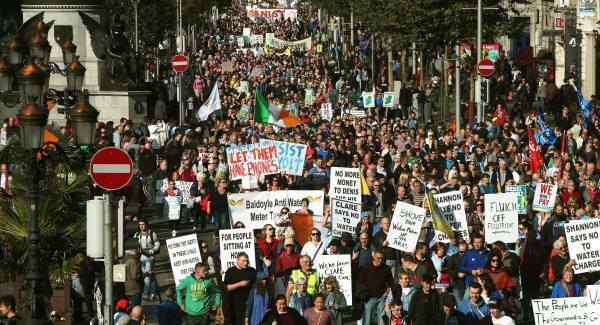 Irish people are flooding the streets week after week to stop water charges. 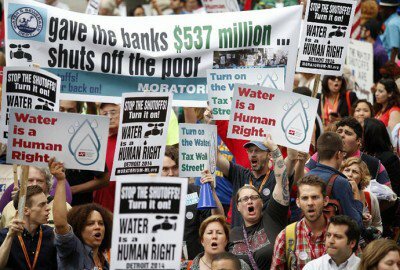 Detroit water shut-offs are part of the banks’ world-wide campaign of austerity against poor and working people as their global empire teeters on the brink of collapse. Like the people of Ireland, Spain, Greece, Latin America, the Middle East, Asia and Africa, Detroiters must rise up en masse to save the actual lives of their children and their future in Detroit. 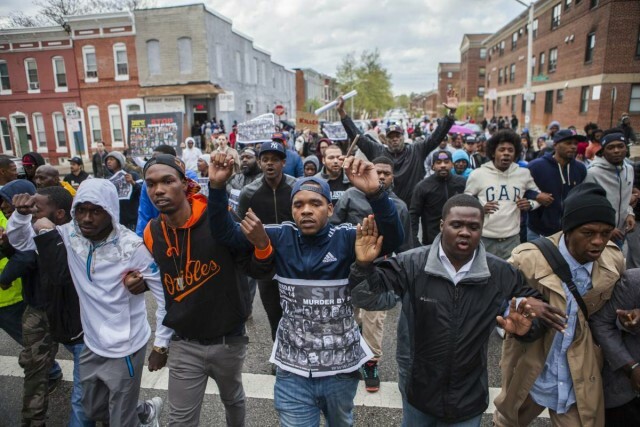 The Baltimore rebellion was not only against police killings; water is being shut off to people there as well, creating a total atmosphere of unlimited war on the poor. 3 Responses to DETROIT SHUTS WATER OFF AGAIN, VIOLATING UN DECLARATION; WHEN WILL CITY RISE UP? Why is it that water bills inside of Detroit city limits are TRIPLE or QUADRUPLE what the suburban bills are? When I lived in the suburbs, my water bill was (at the highest) $120 for 3 months. Now I’m paying $100 – $200 every single month living in the city. I am truly confounded by posts like the ones above. Water infrastructure is a fixed cost, it can’t vary depending on the income of customers. There are water bonds to pay off, maintenance, improvements, etc. The more people don’t pay, the higher the bills have to be for paying customers. That’s why it rises. What the blogger proposes is a plan that will lead to the bankruptcy of the water company, which means water itself will not be available at all for everyone. How about a real solution? This is a complicated problem and there are a lot of smart solutions out there. How about some responsible research instead of this uninformed rant? Water infrastructure is NOT a fixed cost, just as the cost of bonds are not. Infrastructure is built or rebuilt by corporations who charge millions for their contracts, not to mention change orders approved afterwards. These contracts employ general contractors, who get the lion’s share of the profits, while subcontractors do most of the work. One solution is that the City of Detroit itself (or DWSD) can be its OWN General Contractor. DWSD contractors are extremely over priced, and the pols get kickbacks for giving them to their friends. Bond payments consist of principal, plus huge amounts of interest that sometimes approximate the principal payments on a yearly basis, all to make Wall Street richer and richer, until the bubble bursts. If you consider this article a rant, submit one of your own about the “smart solutions” out there.